It's not always easy to get your kids to do what they need to do around the house without a struggle. A great way to get them to do things is to have some incentives. 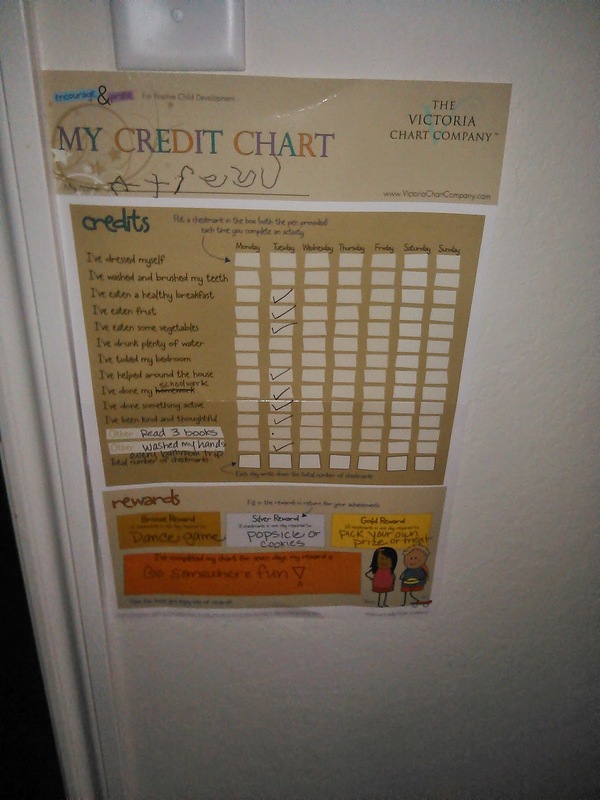 One perfect way of doing this and making it into a routine is to use a reward chart, like the one that I was sent from The Victoria Chart Company---My Credit Chart. The chart covers the following activities: dressed myself, washed and brushed my teeth, eaten a healthy breakfast, eaten fruit, eaten vegetables, drunk plenty of water, tidied my bedroom, helped around the house, done my homework, done something active and been kind and thoughtful. Two extra spaces for you to fill out with activity of your choice. Children write a check mark in the box with the dry-erase marker on completion of an activity. Each day total up the checkmarks and use them towards your rewards of choice. This is such a great idea. Why? Because many kids love being rewarded for things that they do! 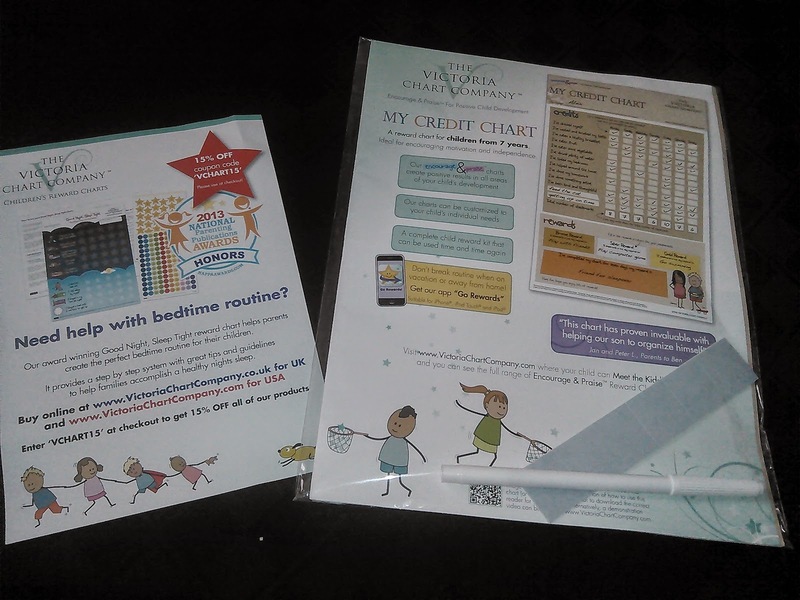 I have actually been using this chart with my son everyday since it arrived. He is homeschooled so I altered homework to school work and added in a few other things in the blank boxes, as you can see in the picture. He is six years old but has been reading since the age of 3 and so he gets really excited when he wakes up and comes to read the board. He loves to complete each activity and then place a check mark next to what he's already done. This chart has been extremely helpful in getting him used to following a routine. It has made my life just a bit easier, which makes me super happy! The only thing that I can suggest for this product if you get it---use thumbtacks. I don't think that the sticky pads work for every wall, especially not textured walls like mine. It doesn't bother me one bit since I have a ton of thumbtacks in the house. Also, you can use any dry erase marker you have. The one that came with my board ran out pretty quickly, but it was simply because my son left it open overnight. Great product. Great way to motivate the kiddos to getting things done around the house. They will have so much fun doing the things you want them to do if they know there's a reward involved :) I definitely recommend! Learn more about this chart and purchase your own here!